The Holy Grail of search engine optimization for a law firm is to get your website in the number one position of the Google search results for your practice area. But contrary to popular belief, Google is not the only game in town. The number varies based on a number of factors, including the demographic of the person doing the search and whether the search in on a computer or mobile device, but Google is used for about 67% of Internet searches. About 29% of the remaining searches are on Bing and Google, with the other 4% spread across a number of other search engines, including Ask, AOL, and my son’s favorite, Duck Duck Go (which truly is the best search engine). If you are using Bluehost or HostGator to host sites for your individual practice areas, then for all intents and purposes your websites are free, other than the $8 per year you are paying for the domain name. As I have said here before, Google can be a harsh mistress, so if it turns a blind eye to your latest creation, check to see how the site is placing on Bing and Yahoo (and maybe even Duck Duck Go). 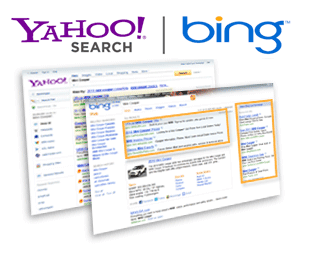 If the site is costing you just $10 per year, and you place well on Bing and Yahoo, then that is still quite the marketing coup. Ten dollars per year for a shot at 29% of the searches in your practice area is a good investment. If you need a little more incentive to believe, Siri on the iPhones (which is now going to appear on some Android devices) does her searches via Bing. If you score one of the first five positions on Bing, then when a potential client lifts their cell phone to their mouth and says, “divorce attorney in Tuscaloosa”, Siri is going to send the client to you, Baby (assuming you are a divorce attorney in Tuscaloosa).